Smoke from burning forests in the Chernobyl exclusion zone is capable of spreading contaminants across great distances, even after the fire has been stopped, ecology experts told RT. 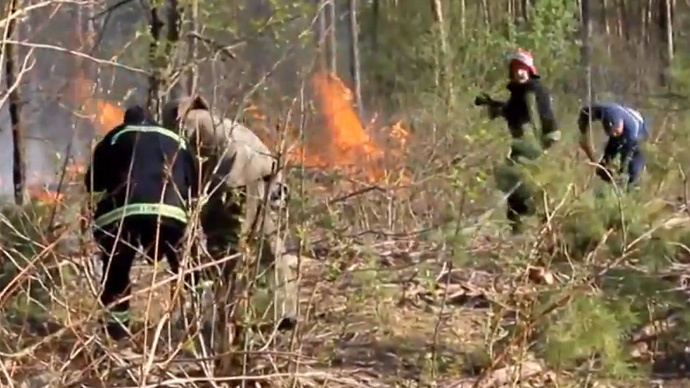 The forest fire near the crippled Chernobyl nuclear power plant started on Tuesday and triggered an emergency alert, with police and National Guard mobilized to bring the flames under control. By Wednesday, the country's Emergency Ministry, as well as the prime minister, who went to the affected area, said the spread of the fire had been stopped and firefighters were containing the remaining flames. Later on Wednesday, Ukrainian TV reported the flames in areas containing radioactive waste have been put out. New hot spots were discovered, but they are outside the exclusion zone. The fire occurred within 30 kilometers of the Chernobyl power plant, inside the exclusion zone which was abandoned and cordoned off almost 30 years ago. In 1986, an explosion and fire in Chernobyl's Reactor 4 caused a release of radioactive particles into the air, which contaminated the surrounding area and caused an increase in radiation levels in Russia, Ukraine, Belarus and across Europe. It was the worst ever nuclear disaster in terms of casualties and clean-up costs. The crippled reactor itself was sealed under a sarcophagus of reinforced concrete. "Brush fires and forest fires were the greatest concern in terms of the means by which you can disperse a secondary radiological impact from the original dissipation that occurred in 1986," he said. John went to Chernobyl in 2006 to assess the situation there and spoke to dozens of scientists working on containing the contamination. "In the exclusion zone and further away you have an area that has been abandoned for farming, abandoned for man management," John says. "That means you've got lots of brush and young wood growing out of control, and that means there's a big fuel load to have a fire." He says the high temperatures and volumes of smoke produced in a forest fire can take contaminants hundreds of kilometers away from the exclusion zone: "Radiation really doesn't respect any international boundaries." "Previous forest fires had re-released about eight percent of the radiation from the original catastrophe. The fire that we're seeing today seems to be on a much larger scale, and so we could see a re-dispersion of a very significant component of the original radiation." Another problem is that as the trees that have absorbed contaminants burn up and release smoke, this turns radioactive particles into a much more dangerous form than if they simply lie in the ground. "Internal radiation from inhalation - in other words, if you inhale something radioactive and it gets inside you - is very much more dangerous than just the background radiation that comes off the ground," says Christopher Busby, the scientific secretary of the European Committee on Radiation Risks. French nuclear safety research institution IRSN created this simulation video, modelling the spread of caesium-137 from the 1986 Chernobyl disaster. Christopher Busby commented on how far radioactive particles can potentially spread: "After Chernobyl itself, they ended up in the atmosphere and they went right across the Baltic States and into Finland, and over Sweden, and then to the United Kingdom, where they caused significant increases in cancer." However, other scientists believe the danger is minimal, because instead of being absorbed from the ground into the vegetation, contaminants actually sank deeper: "30 years on, the radiation in the soil is not on the surface, it has sunk down. New plants have grown on the spot, which contain very small doses of radiation," Leonid Bolshov, from the Russian Academy of Sciences' Institute for safe atomic energy development, told RIA Novosti. He said systems are in place to monitor radioactivity in the area: "When there were [forest] fires in 2010, our institute created a special method of determining the impact of the fires. Back then, we found no danger. The sensors that have been placed everywhere, including the Chernobyl zone, are not supposed to react - and they are not reacting. We checked the sensor in Pripyat today; its readings have been the same for the past two days." Pripyat is the abandoned town closest to the Chernobyl power plant.